Author’s update: As of March 11, 2011, the Hitchhikers.org site seems to be down, but the Hitchhikers.org Facebook Page lists some alternate resources for hitchhiking. I have not checked into any of them personally and am not even sure that the Facebook Page is in any way related to the original organization I wrote about, but their links may be worth checking out. There are dozens of ways to get free or budget accommodations when you travel. At Couch Surfing you can find someone almost anywhere in the world who will allow you to sleep on their couch for free. HouseCarers.com lists home owners who provide free accommodations to travelers who will act as caretakers for their property while they are out of town. Still other agencies arrange for free or reduced accommodations in return for volunteer work. But I have never heard of a way to get free transportation. Until now. I recently learned about Hitchhikers.org, a website that provides travelers with a way to search for rides from Los Angeles to Costa Rica, from Dar es Salaam to Madrid, or just from Amsterdam to Paris. Drivers who are looking for some company (or sometimes a modest fee) submit their rides to the site and hitchhikers search for routes that match their travel plans. They connect through the website and then handle their own arrangements from that point. There is no fee for posting or searching for rides, nor for contacting posters, and the website is available in more than 10 languages. 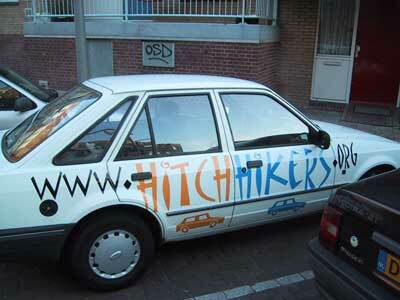 Hitchhikers.org will provide the camera-ready art if you’ll agree to paint your car. Are you game? The developers of the service are enthusiastic hitchhikers. They could not find a site which fulfilled their requirements, so in 1999 they decided to build their own. Initially, it was available only for rides within Europe, but it became so popular that the owners soon expanded to include all continents. Granted, the bulk of the listings are still in Europe, but I did find an inteesting offering for a free ride from Jakarta, Indonesia to Phuket, Thailand. Which made me wonder. There’s an ocean between these two destinations. How’s that gonna work? I’m hoping there’s a ferry ride involved. The site owners are asking users to “help make them famous.” Among their suggestions? Notify the local press; register the site with search engines; link to their site; or put a sticker (which they will gladly provide free of charge) on hitchhiker sites, highway entrances, cars, hostels, Internet cafes, and universities. But the most creative marketing suggestion of all was to paint your car with their logo. They even provide camera ready artwork for your “local car printer.” I think I’ll run right out and do that. How about you? You might have not noticed, but the Hitchhikers.org site is down for some reason (I don’t know if this is temporarily or permanently)… I just thought you would like to know. an update at the top of the post so no one is disappointed. All those of you worried about the situation in Thailands capital, let me advice you, avoit Bangkok! I really am gonna try this out! I guess everything old is new again on the Internet. I am good with the idea of help make them famous but I draw the line at painting my car with their logo. Crazy.